Human beings are rely on medicinal plants for their primary health needs as medicine and natural preservatives in various traditional medicinal systems called siddha, ayurveda, unani and homeopathy. Throughout the world, whole plants have been uprooted extensively from the natural habitats for medicine preparation and it affects nearly 15,000 medicinal plants endurance. Recently, the International Union for Conservation of Nature (IUCN) suggested that, thousands of plants are facing extinction risk due to extensive exploitation, habitat loss, deforestation and lack of conservation knowledge. Requirement of herbal products in the global market is ever increasing, and remarkably, the mass of plant material is still harvested from the forest. Inadequate or unavailability of seeds, seed dormancy, rare seed set production, loss of viability and endophytic bacterial and fungal contaminations in explants are some of the major limitations in the conventional propagation. In fact, it is difficult to produce large volume of plants through conventional propagation as required by pharmaceutical industries, local practitioners or reintroduction schemes. Currently, in vitro propagation and liquid culture protocols are attracting the scientific community to preserve and produce huge amount of plant material, secondary metabolites, suspension culture, synthetic seeds and transgenic plants. The threatened medicinal plants with anticancer properties like Gymnema sylvestre, Leptadenia reticulata, Saussurea involucrata, Caralluma bhupenderiana, Zeyheria montana, Psoralea corylifolia, Gloriosa superba, Swertia chirayita and Nilgirianthus ciliatus have been successfully conserved through in vitro propagation for future demands. In vitro regeneration and conservation of endangered medicinal plants is pave the way for production of pharmacologically active substances especially anticancer compounds. Ancient time onwards, people are relying upon the medicinal and aromatic plants for their major health needs as medicine and natural healers in many treatment systems of Ayurveda. Plant derived secondary metabolites are pharmacologically active substances, which are used as medicine, preservatives, herbicides, colouring pigments, flavour and perfumes. Among the 422,000 flowering plants, about 50,000 plants are worldwide used as a medicine. Particularly, in India about half (43%) of the flowering plants are documented for its pharmaceutical value and medicinal uses of remaining plants are unknown due to the lack of traditional knowledge. Compared with modern medicines, indigenous medicines are low toxic, easy to prepare, low cost and natural availability. In most of the developed countries twenty five percentages of modern drugs are derived from the plants. Around 125,000 flowering plants are available in the tropical forest and it contains lots of pharmaceutically active substances to support the life. They are giving novel therapeutic agents to the modern pharmacopeia for counteracting the various diseases. Even though, to date merely fifty therapeutic drugs are extracted from the tropical forest and almost 1% of the tropical resources only focused for study. 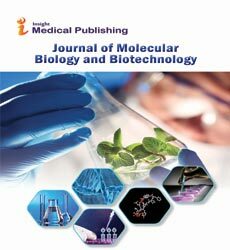 Three potential plant derived drugs were isolated from the North American plants such as Asimina triloba, Taxus brevifolia and Podophyllum peltatum which showed high antitumor activity against ovarian and leukaemia, lymphoma lung, testicular cancers respectively . Now this drugs were successfully crossed the clinical trials and enter into the market for cancer treatments. Since, numerous compounds are undiscovered from these valuable resources because of the lack of traditional knowledge and extinction problems, so these tropical forests are highly protected by various Governmental agencies. According to FAO (Food and Agricultural Organization), the human population will be reach around 9.1 billion at the end of 2050 and 80% of this population solely depends upon the medicinal plants for their health care. The European Commission (2008) stated that 83% of medicinal and aromatic plants are disturbed by the human anthropogenic activities like over exploitation, environmental pollution, deforestation and plantation of invasive species to scare the biodiversity. The medicinal and aromatic plants are significant sources of novel pharmaceutical drugs to develop disease free society from harmful pathogens . Nowadays, the pharmaceutical demand was very high due to various health concerns like malaria, dengue, cancer, Alzheimer and AIDS etc. The medicine preparation especially from plants was main focus of several researchers and pharma industries which is less cost, low toxicity and side effects compare to modern medicines. For therapeutic needs, medicinal plants are over utilized by local practitioners and pharmaceutical industries. Owing to over harvesting, more number of plant species became endangered from the wild. According to the IUCN, nearly 15,000 medicinal plants worldwide may be threatened with extinction caused by overharvesting. Our world is losing at least one potential major drug in each two years (World Atlas of Biodiversity, 1995). At present, world is looking for alternative medicine to conventional antibiotics due to the multidrug resistant pathogens. Based on IUCN (2016) report, from the year 1996 to 2016, gradual loss of several pharmacologically important medicinal plants was found and they are facing extinction threat due to lack of suitable propagation system. Globally, almost four million people are getting primary healing from the traditional system of medicine with the use of plants . The global need for this green medicine is high and also increasing. The trade of ayurvedic medicine is expanding day by day which is estimated that 20% annually in India. Alternatively many medicinal plants with commercial importance are facing extinction or severe genetic loss from the natural habitat at an alarming rate. This is due to natural habitat loss, unscientific management practices such as indiscriminate collection, trade, and destruction due to rapid urban development. Therefore, the scientific community is in the need to preserve those endangered, vulnerable and rare plant species for future pharmacological demands. More than 50,000 plant species worldwide used for therapeutic purposes and it estimated that around one tenth of total plants in the earth. India and China are having huge collection of medicinal and aromatic plants up to 7500 and 11,146 respectively. Medicinal plants play a key in modern pharmaceutical system to treat various diseases and it is an important source of economy to the countries. In Europe, about 1300 medicinal and aromatic plants are used for the treatment and 90% of those plants are directly collected from the nature without any cultivation. There are 118 potential drugs of the top 150 recommended drugs in the US are frankly derived from the wild resources. Due to its extreme requirements to the drugs preparation, 70% of plants are collected in the lethal way and it affects the plant growth and development. The extensive collection, deforestation, introduction of exotic species, endophytic infections and habitat loss are the main causative agents to suppress the growth of plant species. It accelerates the speed of plant extinction from the wild and conservationist evaluated that the present plant extinction rate is between 100 and 1000 fold high compare to natural extinction. Many of the plants are endemic, and it is the believed source of medicine to those region associated people. So conservation of threatened medicinal plants from the possible extinction is the current research today . These plants are producing several secondary metabolites during growth period against various climatic conditions for plant protection. Secondary metabolites are chemically new and exhibit different activities like antimicrobial, antifungal, antioxidant, antimalarial and anticancer etc. Through random collection methodology, National Cancer Institute (NCI, USA) initiated to search around 35,000 plant samples for anticancer compounds during 1960 to 1982. They have identified many compounds like paclitaxel, topotecan, 9-aminocamptothecin and CPT-11 from around 114,000 plant extracts against diverse tumour cell lines. The gradual collection of plant material for novel therapeutic agents without replacement depletes the natural resources and makes number of plants into endanger. According to IUCN Species Survival Commission, (2007) thousands of plants are facing survival risk especially various anticancer plants like Gymnema sylvestre and Nilgirianthus ciliatus are facing the problem of extinction. Plenty of plants with useful phytochemicals face extinction or severe genetic loss due to increasing needs of their products. Therefore, it is the primary task of the scientific society to monitor and multiply these species . In here, particularly we are focussed on the IUCN red listed, vulnerable or endangered plant species which are having potent anticancer activity. 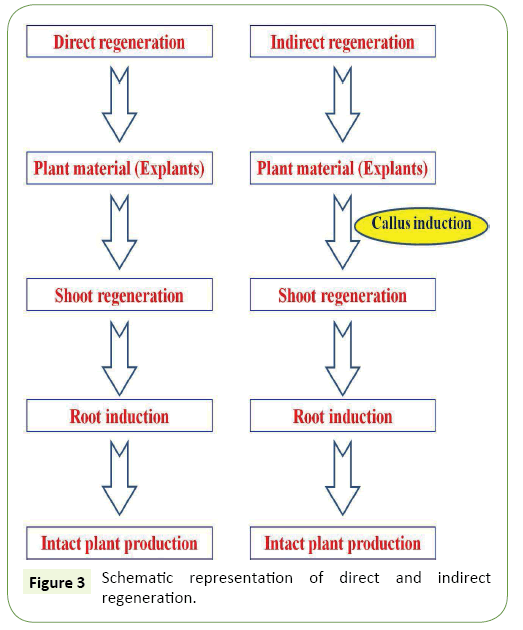 Those red listed plants are conserved through in vitro regeneration system which was described in this chapter and Figure 1 outlines this proposed book chapter (Table 1 and Figure 1). Table 1 List of useful threatened plants. 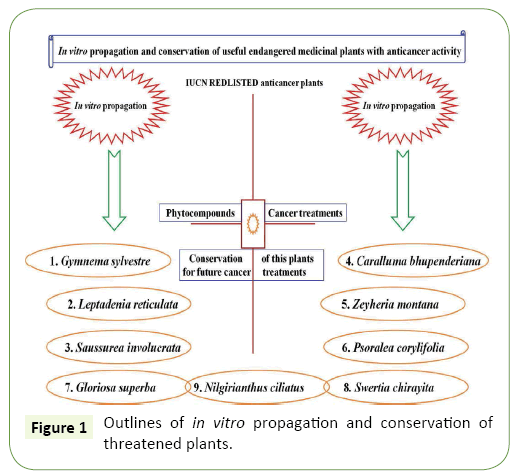 Figure 1: Outlines of in vitro propagation and conservation of threatened plants. As per IUCN red list version 2016-2, from 1996 to 2016 numerous medicinal plants with prospective uses are facing risk of extinction due to lack of conservation knowledge, extensive exploitation by pharmaceutical industries, habitat loss and deforestation. Many of the plants are not able to regenerate naturally due to lack of regeneration ability, low seed production and viability, bacterial and fungal infections. Therefore, compare to conventional method modern biotechnological techniques has been used to produce huge plant materials as required to the pharma industries. Currently, in vitro propagation systems were usually developed for IUCN red listed medicinal plants with anticancer activity such as Gymnema sylvestre, Leptadenia reticulata, Saussurea involucrate, Caralluma bhupenderiana, Zeyheria Montana, Psoralea corylifolia, Gloriosa superba, Swertia chirayita and Nilgirianthus ciliatus for plant propagation . In addition, development of transgenic plants, secondary metabolites, suspension culture and synthetic seeds are relies on in vitro regeneration system. It helps to produce disease free plants with active regenerative ability, genetic integrity and short or low term storability. Sustainable utilization of the threatened medicinal plants was shown in Figure 2 . By conventional method, seeds or stem cuttings based plant propagation and in biotechnology direct or indirect method has been employed for plant regeneration (Figures 2 and 3). Figure 2: Schematic representation of sustainable utilization of threatened plants. Figure 3: Schematic representation of direct and indirect regeneration. Gymnema sylvestre belongs to the family of Asclepiadaceae and distributed in the tropical and subtropical regions of India, Sri Lanka, China, Malaysia and Africa. It is a perennial, woody climber contains various pharmaceutical activities. This genus is divided into 40 different groups such as G. inodorum, G. sylvestre, G. yunnanense and G. montanum etc. Among the 40 different species, G. sylvestre frequently called as “gurmar” and it act as a sugar reducing agent in the Ayurvedic therapy. This plant is the source of gurmarin, polypeptide, gymnemasaponins and gymnemic acids act as a sugar controlling agents. G. sylvestre is used as a strong antidiabetic plant for more than 2000 years of traditional healthcare system . G. sylvestre is the IUCN red listed endangered species of Asclepiadaceae family and used to treat diabetic, eye problems, inflammations, asthma and insect bites. This plant extracts showed various biological activities like antimicrobial, antidiabetic, antihypercholestrerol, hepatoprotective and anticancer. Due to its enormous requirement in the medicine preparation, this plant has been over exploited from the nature. Now this plant is under endangered condition. These plants are slow growing and seeds are recalcitrant, therefore stem cuttings used for plant propagation. Generally, stem cuttings are not produced enough number of plants as required for plant protection or medicine preparation. Therefore, in vitro regeneration system has been proposed for mass production . In vitro regeneration has been studied widely by various groups in Gymnema species, aseptic axillary nodes of G. sylvestre were inoculated on MS medium supplemented with 1 mg l−1 6-benzyladenine (BA), 0.5 mg l−1 kinetin (KIN), 0.1 mg l−1 1-napthalene acetic acid (NAA), 100 mg l−1 malt extract and 100 mg l−1 citric acid and kept under 30 d of light incubation. After 30th d, multiple shoots (57.2 numbers/explants) were developed then shoots were carefully subcultured on rooting media. For in vitro rooting, the shoots are excised and cultured on half strength MS medium containing 3.0 mg l−1 indole-3-butyric acid (IBA) for 50 d light incubation. After the incubation period, about 50% of shoots were produced healthy roots (8.9 cm in length). The well rooted plants were acclimatized in the soil for further propagation and using this protocol G. sylvestre plants were successfully regenerated in the laboratory for future preservation and utilization (Table 2). Table 2 In vitro regeneration conditions for selective IUCN REDLISTED medicinal plants. 1. Gymnema sylvestre MS medium supplemented with 1 mg l-1 BA + 0.5 mg l-1 KIN + 0.1 mg l-1 NAA + 100 mg l-1 malt extract + 100 mg l-1 citric acid found 84% of regeneration after 30 days of light incubation. Half strength MS medium containing 3.0 mg l-1 IBA showed 50% of rooting after 50 days of light incubation. 2. Leptadenia reticulata MS medium supplemented with 0.25 mg l-1 BA + 0.25 mg l-1 KIN showed 90% of regeneration after 28 days of light incubation. MS medium containing 2.0 mg l-1 IBA + 200 mg l-1 activated charcoal showed 87% of rooting after 28 days of light incubation. 3. Saussurea involucrate MS medium supplemented with 10 µM BA + 2.5 µM NAA showed 66% of regeneration after 40 days of light incubation. Half strength MS medium containing 2.5 µM IAA showed 87% of rooting after 28 days of light incubation. 4. Caralluma bhupenderiana MS medium supplemented with 8.87 µM BA + 2.85 µM IAA + 100 mg l-1 ascorbic acid showed 93% of regeneration after 42 days of light incubation. Half strength MS medium containing 2.69 µM NAA showed 88% of rooting after 25 days of light incubation. 5. Zeyheria Montana ¼ strength MS medium containing 0.1 mg l-1 BA + 0.5 mg l-1 GA3 showed 70% of in vitro regeneration. ¼ strength MS medium + 1.5 mg l-1 IBA showed 65% of rooting. 6. Psoraleacorylifolia MS medium supplemented with 12 µM BA + 10 µM NAA + 15 µM Kn showed 95% of regeneration. ½ strength MS medium + 2.5 µM IBA showed 95% of efficient rooting. 7. Gloriosa superba MS medium supplemented with 2 mg l-1 BA + 0.5 mg l-1 NAA showed 76.6% of regeneration. ½ MS medium containing + 1 mg l-1 NAA + 0.5 mg l-1 IBA showed 66.6% of rooting. 8. Swertia chirayita MS medium supplemented with 2 mg l-1 BA + 0.1 mg l-1 IAA showed 83.0% of regeneration. MS medium alone showed 80.0% of rooting. 9. Nilgirianthus ciliatus MS medium supplemented with 3 mg l-1 BA + 0.1 mg l-1 IAA showed 93.2% of regeneration. 1/2 MS medium containing + 1 mg l-1 IBA showed 82.2% of rooting. Leptadenia reticulata is one of the IUCN red listed, endangered plant of Asclepiadaceae family and popularly known as Swarna Jivanti or Jivanti to give a life or strength. It is a woody climber and widely used to cure tuberculosis, cough, fever, inflammation, dyspnoea, night blindness, ear and nose problems. L. reticulata, also having various biological activities like antimicrobial, antitumor and anticancer. Due to overexploitation by the medical practitioners this plants needs an alternate way of propagation for plant survival and multiplication. However, traditional regeneration system are unable to balance this extinction rate, therefore development of standard in vitro regeneration protocol is required. Formerly, in vitro regeneration using different explants of this plant was studied by various groups. The node explants of L. reticulata were inoculated on MS medium supplemented with 0.25 mg l−1 6-benzyladenine (BA) + 0.25 mg l−1 kinetin (KIN) and found 90% plantlet regeneration with 5.7 shoots after 28 d of light incubation. Further, the shoots were rooted on MS medium supplemented with 2 mg l−1 indole-3-butyric acid (IBA) + 200 mg l−1 activated charcoal and produced 87% of efficient roots. Finally, the in vitro raised plants were maintained in the nursery for field establishment (Table 2). Saussurea involucrata is an endangered Chinese plant (Asteraceae family) used to cure gynopathy, rheumatoid arthritis, inflammation, nociceptive pain and altitude related disorders. L. reticulata possess several phytochemicals like syring, hispidulin and rutin were accounted for antiaging, immune modulator and anticancer properties. The plant has become an endangered owing to over exploitation from the wild, lack of seed viability and habitat loss . Therefore, the development of in vitro regeneration protocol is essential for conservation of this pharmacologically important plant from possible extinction. Leaf explants of S. involucrata were cultured on MS medium supplemented with 10 μM 6-benzyladenine (BA)+2.5 μM 1-naphthaleneacetic acid (NAA) showed 5.2 numbers of shoots with 66% of plant regeneration within 40 days of light incubation. For in vitro rooting, the shoots were cultured on MS medium supplemented with 2.5 μM indole- 3-acetic acid (IAA) produced 87% of efficient roots within 28 days. The in vitro produced plants were maintained in the nursery for field establishment (Table 2). Caralluma bhupenderiana, belongs to Apocynaceae family and it is an endemic and endangered plant of Southern India. It contains variety of phytochemicals and showed antitumor, anticancer and antiulcer activities. Due to habitat loss, over harvesting and loss of viability affects the populations of C. bhupenderiana from the wild conditions leads to the endangered . So as to conservation of this plant, in vitro regeneration protocol has been established through nodal explants. The nodal explants were cultured on MS medium containing 8.87 μM 6-benzyladenine (BA) + 2.85 μM indole-3-acetic acid (IAA) + 100 mg l-1 ascorbic acid showed 93% of regeneration with 8.6 numbers of shoot within 42 days of light incubation. For in vitro rooting, the shoots were cultured on MS medium fortified with 2.69 μM 1-naphthaleneacetic acid (NAA) produced 88% of efficient roots after 25 days. At the end the micropropagated plants were kept in the nursery for field establishment (Table 2). Zeyheria montana is the Brazilian endangered medicinal plant of Bignoniaceae family. It having number of phytochemicals like oleanoic acid, lapachol, β-lapachone, ursolic acid and they are responsible for antioxidant, antimicrobial and anticancer properties. Due to its medicinal value, this plant is extensively utilized by the pharmaceutical industries and it becomes endangered from the wild . Thus the development of in vitro regeneration system is helpful to preserve the plant from possible extinction. According to a study related to regeneration, the mature zygotic embryos were isolated from Z. montana and cultured on half strength MS medium supplemented with 0.5 mg l-1 6-benzyladenine (BA) + 2.0 mg l-1 gibberellic acid (GA3). The shoots were developed from the embryo and the nodal explants and used for further regeneration experiments. The nodes were inoculated on ¼ strength MS medium supplemented with 0.1 mg l-1 BA + 0.5 mg l-1 GA3. The around 70% of plants were regenerated with 7.3 numbers of shoots per nodes within 60 days of light incubation. For in vitro rooting, the shoots were rooted into ¼ strength MS medium containing 1.5 mg l-1 indole-3-butyric acid with 65% of rooting. The successfully rooted plants were further transported in the paper cups and maintained in the nursery for field establishment (Table 2). Psoralea corylifolia is an endangered plant of Fabaceae family and distributed towards tropical and subtropical regions of the world. It is used in the treatment of antihelmintic, stomach pain, diabetes, diuretics and diaphoretic in feverish time. P. corylifolia plants are having several bioactive compounds like angelicin, coumarins, isopsoralen and psoralen which accounted for antibacterial, antifungal, antioxidant and antitumor activities. Due to extensive collection of this plant from the wild, conservation of this plant through in vitro regeneration is essential . In this case, the shoot apical meristems were collected and cultured on MS medium supplemented with 12 μM BAP, 10 μM NAA and 15 μM KIN for shoot regeneration. This combination showed high frequency of shoot regeneration up to 95% with 6.12 shoots per explant was produced. The in vitro produced shoots were subcultured on the MS medium containing 2.5 μM IBA for rooting. After the light incubation, 95% of roots produced with 6.8 and 7.11 (cm) root number and length respectively on the same medium. The fruitfully rooted plants were further transplanted in the paper cups and maintained in the nursery for field establishment (Table 2). Gloriosa superba is an endangered, ornamental plant of Liliaceae family and traditionally used to control arthritis, ulcers, bleeding piles, skin diseases, snake bites, rheumatism and leprosy. It is frequently called as Flame lily or Glory lily and available in different regions of Asia and Africa. It is a perennial climb spread up to 3.5-6.0 m and produce tubers in various shapes like L, V and finger. Leaves are arranged into opposite, dark green, shiny expand when plants are growing . These plants are having various phytoconstituents such as alkaloids, N-formyldeacetylcolchicine, colchicine, 3-demethyl- N-deformyl-N-deacetylcolchicine, gloriosine, lumicolchicine, 3-demethylcolchicine. Especially, the roots are highly toxic and it contains superbine, colchicines, sterols, tannins, N-formyl, gloriosine, N-deacetyl colchicines, benzoic acid, salicylic acid, resinous substances-colchicines, 3-demethyl colchicine, 1,2-didemethyl colchicine, 2,3- didemethyl colchicines and colchicocide. These phyochemicals are responsible for various activities like antivenom, anticoagulent, antimicrobial, antiinflammatory, antihelmintic anticancer, hapatoprotactive activity, antioxidant activity etc. Due to its unique pharmaceutical values, this plant material has high demand in the local and international markets. The huge requirement of this plant parts directed to destructive collection from the nature. In addition, habitat destruction, deforestation and low seed viability and stress prone condition are also placed this plant under endangered conditions. In order to preserve this G. superba plants, in vitro regeneration system has been established using different plant growth regulators. The aseptic shoot tips were cultured on MS medium prepared with 2 mg l-1 BAP and 0.5 mg l-1 NAA for shoot regeneration. After the light incubation, 76.6% of regeneration frequency with 1.2 numbers of shoots per explant was found. The regenerated shoots were transferred in to the half strength MS medium containing 1 mg l-1 NAA and 0.5 mg l-1 IBA for in vitro rooting. The roots were produced with the frequency of 66.6% and the intact plants were planted in the paper cups. The in vitro raised plants are maintained in the nursery for field establishment (Table 2). Swertia chirayita is a yearly or biennial herb of Himalayan region with 0.6-1.5 m growing. This plant is belongs to the Gentianaceae family and traditionally used as liver booster, anti-inflammatory, antihelmintic, antimalarial, blood purifier, and antidiabetes. S. chirayita possess various phytochemicals like amarogentin, xanthones, xanthone C-glucoside, swertiamarin, flavonoids, mangiferin, iridoids, secoiridoid glycosides and swertiamarin responsible for many pharmacological activities including anticancer . As per IUCN this plant recognized as critically endanger so conservation of S. chirayita is significant for future generation. Owing to its medicinal value this plant is highly utilized for the pharmaceutical purposes. In order to save this plant, the in vitro regeneration protocol has been developed using nodal explants. Surface sterilized nodal explants were cultured on MS medium containing 2 mg l-1 BA for shoot regeneration. After 30 d of light incubation nodal explants were produced 83% shoots with shoot number (5.8) and length (3.5 cm). The proliferated shoots were cultured on only MS medium without plant growth regulators for rooting. After eight weeks of light incubation, the shoots were produced 80% of roots and the intact plants were planted in the paper cups. The in vitro raised plants are maintained in the nursery for field establishment (Table 2). Nilgirianthus ciliatus is an endemic undershrub of tropical forests of southern Western Ghats, India with high trade value. The presence of various bioactive compounds like betulin, lupeol, stigmasterol, stigmasterol glycoside and taraxerol are demands in the global markets therefore local practioners and pharmaceutists were depends this plant resource . Recently, the IUCN identified this plant as vulnerable due to overharvesting by local groups or therapeutic companies and habitat loss. The plant extracts are having number of biological activities like antimicrobial, analgesic, anticancer, hepatoprotective and antioxidant. Low viable or unavailability of seeds, seed dormancy, and rare seed set production are cause this plant in to vulnerable condition, therefore conventional propagation not so fruitful to produce huge amount of plant materials as required to pharma industries. In order to raise the in vitro plants, nodal explants were grown on MS medium amended with 3 mg l-1 BA and 0.1 mg l-1 IAA were used. The maximum regeneration percentage 93.2% with bunch of shoots around 24.3 were found after 42 days. The regenerated shoots were rooted on 1/2 MS medium containing 1 mg l-1 IBA and found 82.2% rooting with roots number (14.2) and length (8.9 cm). These plants are acclimatized in the soil with 100% survival rate. Finally, the in vitro regenerated plants were kept in the nursery for field reintroduction [17,18]. Medicinal plants are harbouring thousands of secondary metabolites for their own endurance to tolerate the various biotic and abiotic stresses during growth. Interestingly, these phytochemicals are vast, diverse and having antimicrobial, antioxidant, antimalarial and anticancer properties. Among the various properties, anticancer shows the significant importance in the field cancer treatment. Cancer is the second leading cause of death in the world and it can affect any organ of the body with high mortality rate. Therefore, finding the novel bioactive compounds against cancer cell is the idea of the modern researchers. These bioactive compounds activate the natural cell death (apoptosis), cell shrinkage, membrane blebbing in the cancer cell. The endangered medicinal plant, Gloriosa superba showed potent anticancer activity against colon cancer cell line. It may be the presence of phenolics, saponins, tannin and alkaloids compounds. Similarly, Leptadenia reticulata plant is in the threatened list and it contains cardiac and pregnane glycosides, alkaloids, β-amyrin acetate, leptadenol, β-cytosterol, cetyl alcohol, diglucoside, lupanol-3-o- and Ntricontane. Among these, cardiac and pregnane glycoside is a potential anticancer agent . In Zeyheria montana, two active compounds such as lapachol and naphthoquinone were isolated and found anticancer activity against tested cancer cells. The Lapachol is the precursor for β-lapachone and it is a potential drug used in the cancer treatment. Additionally, this plant is having various compounds like betulic acids, oleanoic acid, pentacyclictriterpenoids and ursolic acid with anticancer activities. The antimetastatic activity of Saussurea involucrata extracts were observed on the carcinogenic cells which contains hispidulin, apigenin and rutin compounds. These phytochemicals play a major role to control the movement of cancinogenic cell to the other locations. Likewise, several thousands of compounds are unrevealed from the nature due to the absence of traditional knowledge. Therefore, conservation of those kinds of endangered medicinal plants with potential anticancer activity is essential for future pharmacopeia demands . Gradually, many of the ayurvedically important medicinal plants with anticancer properties are declining in the wild conditions due to lack of conservation policies. This elevated extinction rate will suffer the human society in future generation, subsequently this is the time to take an effort to study and care those threatened plants with constant propagation system. Nowadays, micropropagation is the leading, innovative and invaluable tool to conserve the medicinal plants from probable destruction. Afterwards, reintroduction of in vitro produced genetically stable lines of plant species to the native environment for re-establishing the affected biodiversity. Among the various medicinal values, anticancer property was considered more by pharmaceutics due to the high mortality rate of human beings. Unfortunately, many of the medicinal plants metabolic profiling has not been studied scientifically and even traditional knowledge also not in the proper document. This leads to loss of various therapeutic compounds as well as the genetic resources from the nature is the common issue today. Therefore, an attempt was made to explore some of the medicinal plants with endangered condition were focused on this subject for plant preservation. In future, these threatened medicinal plants will be multiplied in the stable regeneration system for exploring potent anticancer compounds for cancer treatment. This chapter highly discussed two aspects in above, one is the therapeutic potential especially cancer inhibitors of the medicinal plants and its conservational needs and another to illustrates the various in vitro regeneration methods for efficient plant propagation. At the outset, this chapter possibly concludes with an aim of sustainable preservation and utilization of anticancer plants and its compounds for future generations. It will protect these medicinal resources from possible extinction and also supply our constant pharmacological demands. Agrawal A (2005) Current issues in quality control of natural products. Pharma Times 37: 9-11. Amudha P, Shanthi P (2011) Antioxidant activity of some rare medicinal plants. J Pharm Res 4: 698-699. Anis M, Faisal M (2005) In vitro regeneration and mass multiplication of Psoraleacorylifolia-An endangered medicinal plant. Indian J Biotechnol 4: 261-264. Atanasov AG, Waltenberger B, Pferschy-Wenzig E, Linder T, Wawrosch C, et al. (2015) Discovery and resupply of pharmacologically active plant derived natural products: A review. Biotechnol Adv 33: 1582-1614. Bertoni BW, Moraes RM, Previdelli LL, Pereira PS, De Castro Franca S, et al. (2013) In Vitro propagation and conservation of Zeyheriamontana Mart: an endangered medicinal plant. Am J Plant Sci 4: 519-523. Byambaragchaa M, De la Cruz J, Yang SH, Hwang SG (2013) Anti-metastatic potential of ethanol extract of Saussureainvolucrata against hepatic cancer in vitro. ‎Asian Pac J Cancer 14: 5397-5402. Cardoso JC, Da Silva JAT (2013) Micropropagation of Zeyheriamontana Mart. (Bignoniaceae), an endangered endemic medicinal species from the Brazilian cerrado biome. In Vitro Cell Dev Biol Plant 49: 710-716. Chen SL, Yu H, Luo HM, Wu Q, Li CF, et al. (2016) Conservation and sustainable use of medicinal plants: problems, progress, and prospects. Chin Med J 11: 37-47. Godfray HCJ, Beddington JR, Crute IR, Haddad L, Lawrence D, et al. (2010) The challenge of feeding 9 billion people. Science 327: 812-818. Grover JK, Yadav S, Vats V (2002) Medicinal plants of India with anti-diabetic potential. J Ethnopharmacol 81: 81-100. Guo B, Gao M, Liu CZ (2007) In vitro propagation of an endangered medicinal plant Saussureainvolucrata Kar.et Kir. Plant Cell Rep 26: 261-265. Gurib-Fakim A (2006) Medicinal plants: Traditions of yesterday and drugs of tomorrow. Mol Aspects Med 27: 1-93. Haroon K, Murad AK, Iqbal H (2008) Enzyme inhibition activities of the extracts from rhizomes of G. superba Linn (Colchicaceae). J Enzyme Inhib Med Chem 22: 722-725. Hemaiswarya S, Raja R, Anbazhagan C, Thiagarajan V (2009) Antimicrobial and mutagenic properties of the root tubers of G. superba Linn. (kalihari). Pak J Bot 41: 293-299. Hunde D (2007) Human influence and threat to biodiversity and sustainable living. Ethiop J Edu Sci 1: 85-94. Hussain MS, Fareed S, Ansari S, Rahman MA, Ahmad IZ, et al. (2012) Current approaches toward production of secondary plant metabolites. J Pharm Bioallied Sci 4: 10-20. Imoto T, Miyasaka A, Ishima R, Akasaka K (1991) A novel peptide isolated from the leaves of Gymnemasylvestre-I. Characterization and its suppressive effect on the neural responses to sweet taste stimuli in the rat. Comp Biochem Physiol Part A Physiol 100: 309-314. Jachak SM, Saklani A (2007) Challenges and opportunities in drug discovery from plants. Curr Sci 92: 1251-1257. Jain AP, Suryavanshi S (2010) G. superba Linn.-A pharmacological review. Int J Pharm Res Dev 2: 24-26.